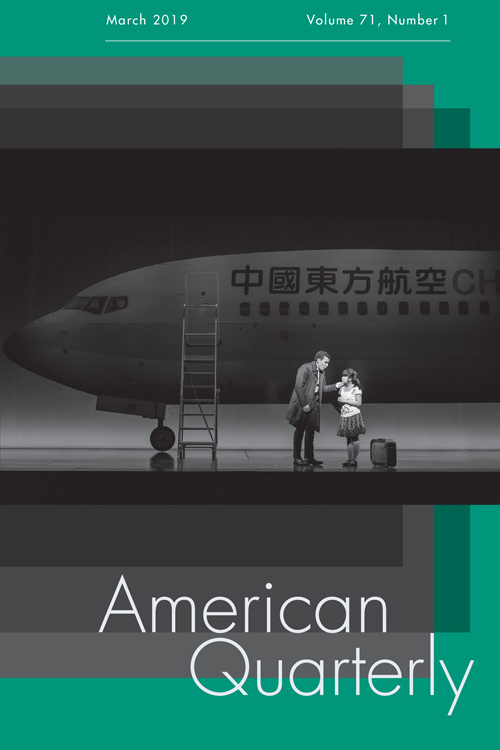 Available now: American Quarterly March 2019, Volume 71, Issue 1. Make sure to visit the Beyond the Page section for supplementary content. The five essays in this issue exemplify the types of transnational interdisciplinary scholarship in which our editorial board is particularly invested. Conceptually ambitious, methodologically innovative, and analytically original, these essays represent the state of the field, and they are also impressive in their thematic, chronological, and geographic spread and their relevance to contemporary politics both domestic and global. The forum, “Centering Pleasure and Anti-Respectability in Black Studies,” convened by Christina Carney, pulls together an exciting array of essays that address sexuality and pleasure, topics that have been difficult to tackle in black studies. The three book reviews, by Gabriella Friedman, Karen Buenavista Hanna and Mark John Sanchez, and Esmat Elhalaby, discuss new works on speculation, cultures of empire and international solidarity, and the role of area studies in the United States and the world. In Event Reviews, A. B. Wilkinson discusses the exhibit on Sally Hemings at Thomas Jefferson’s Monticello, and Dorinne Kondo reviews David Henry Hwang’s groundbreaking new musical, Soft Power. Digital Project Reviews features three works: Donna Arkee discusses the Hackers of Resistance, Carly A. Kocurek reviews Baltimore ’68: Riots and Rebirth, and Jim McGrath discusses the digital project Newest Americans. Kāwika Tengan, is the winner of the 2016 Council of Editors of Learned Journals (CELJ) Award for Best Special Issue. Thank you to Paul and Ty for their vision and leadership and to all the contributors to the special issue! The September 2012 issue of American Quarterly (Volume 64, Issue 3) was recognized as the co-winner of Best Special Issue by The Council of Editors of Learned Journals (CELJ). The journal has updated its Author Guidelines to introduce an online submission system. American Quarterly is dedicated to being a forum for intellectual exchange among American studies scholars. Good scholarship is only worthwhile if it is shared. 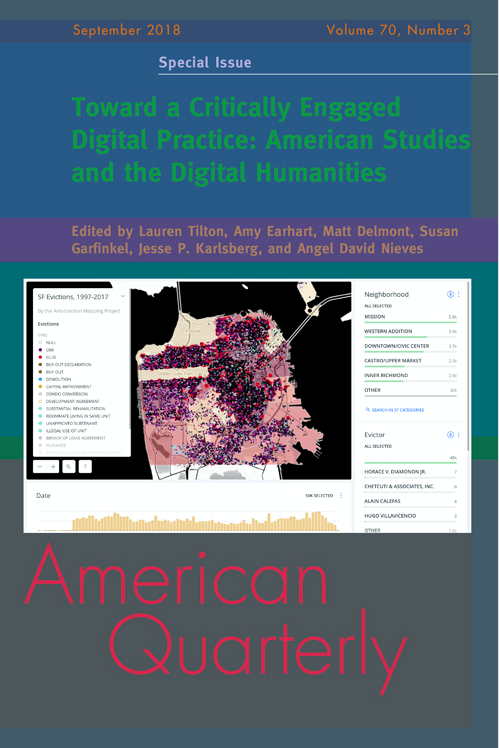 Interdisciplinary scholarship in American studies hinges on communication between its scholars, and as the foremost journal of its kind, American Quarterly is at the center of this dialogue. To order online please visit the Johns Hopkins University Press website.